Caithness is the most northerly county in mainland Scotland, or at least it was until counties ceased to exist in 1975. It also offers one of the richest cultural landscapes in Europe. The relative geographical isolation of the area, combined with traditional patterns of landholding, the survival of large estates and the use of stone as the main building material since earliest times, means that Caithness offers a wide range of ancient monuments in a profusion rarely equalled elsewhere in Scotland. Rather more recently, in the 1800s, Caithness was at the forefront of archaeological exploration that did much to help establish our understanding of Scottish prehistory. But times have changed. Some exploration of the area's past has continued, but the archaeology of Caithness has become rather marginalised and there is a perception that there are only a handful of archaeological sites for visitors to enjoy and the archaeologist to uncover and interpret. As the authors of this beautifully produced and fascinating book put it: "It always infuriates us when we stay in the county's bed and breakfasts and hotels that, with very few exceptions, all literature in our rooms promises day trips to Orkney. The archaeology of Orkney is breathtaking and well worth many visits, but surely a few leaflets on Caithness' prehistoric remains is not too much to ask for. Apparently it is." 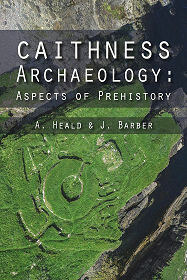 "Caithness Archaeology: Aspects of Prehistory" helps redress this imbalance. The authors have both been professionally involved in a wide range of projects in Caithness and their book is an excellent starting point for anyone wanting to find out more. It isn't a guidebook as such, and neither is it a catalogue of the very large number of ancient monuments in the area. Rather it takes a more personal approach. After setting the scene, the main body of the book comprises thirteen sections, each looking at a different type of ancient monument. Within each section a few notable monuments are discussed in detail. At times the discussion focuses on the characteristics of the site itself, while in other places it leads on the story of the monument's discovery and initial exploration, casting light on some of the key personalities involved in the early archaeological exploration of Caithness. Anyone living in the area, and especially anyone travelling north across Caithness in order to reach the much better-known archaeological wonders of Orkney should read this book. You will emerge intrigued and inspired, and more than a little wiser: perhaps, like this reviewer, discovering that for the first time that "wag" and "jelly baby" are terms relevant to the ancient history of this area.